Driving through Elgin a few years ago, Mickie Spencer stumbled upon a time capsule. When the doors of Jones Drug Store locked for the last time in 1975, inside were the accumulated artifacts of a business which had served the small Hill Country town since the 1920s. Mickie didn’t yet have a home for it yet, but the acclaimed Austin restaurant designer could not resist snapping up the collection. Her new-found treasures inspired Mickie to dream of a pharmacy-like concept, but as yet she had no site in mind. When she discovered that the old Hillside Pharmacy building on East 11th in Austin was available, she knew it was a perfect fit. Ulysses “Doc” Young, one of only a handful of black pharmacists in the city at the time, owned and operated the drugstore there from 1950 until he retired in 1976. In the years that followed, the structure was home to assorted businesses, and saw periods of vacancy. All had left their mark, and Mickie had her work cut out for her. But her success with restaurant/design venue East Side Showroom left little doubt that she could pull off a floor-to-ceiling redo in her signature style. Today, old hutches with sliding glass doors, drawer units, and all manner of drugstore miscellany set the theme for her Hillside Farmacy restaurant. Tin ceilings and original hex-tiled floors are the perfect backdrop for the upcycled salvage that is Mickie’s trademark. This singular venue calls for food that is unique. For that, she calls on partner and executive chef Sonya Coté. Her team also includes Greg Mathews and Jade Place-Mathews, who keep the business aspect on track and manage the styling of the drink and wine menus. Assisting Mickie and her partners is Thorne Russell, who orchestrates front of house with strong organizational skills and uncommon personal style. “Our name isn’t just a funny gimmick,” say Thorne. More than simply a clever nod to the building’s history, the Farmacy spelling speaks to the health benefits of a fresh, thoughtful menu prepared with product brought to the table as directly as possible from local farms and purveyors. Listed across the bottom of the menu are Hillside’s key providers of meats, produce, cheeses, baked goods, honey, ice cream, seasonings and beverages. Hillside Farmacy’s success shows that patrons are willing to pay a bit more for beautiful plates prepared with that food philosophy. “But,” says Thorne, “of course we have the classic problem of doing local and organic—it costs more. You can’t beat the prices of huge distributors. Working with people who run smaller, home grown businesses to get the product we want is challenging,” says Thorne. Controlling costs and vendor relationships in that context is a big job that falls to Sonya, as she oversees the broader food picture. 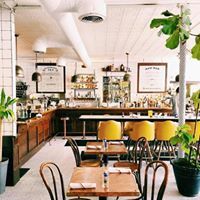 While prioritizing the restaurant’s approach, she does include some conventional provisioning in order to maintain a price point that will draw repeat customers. 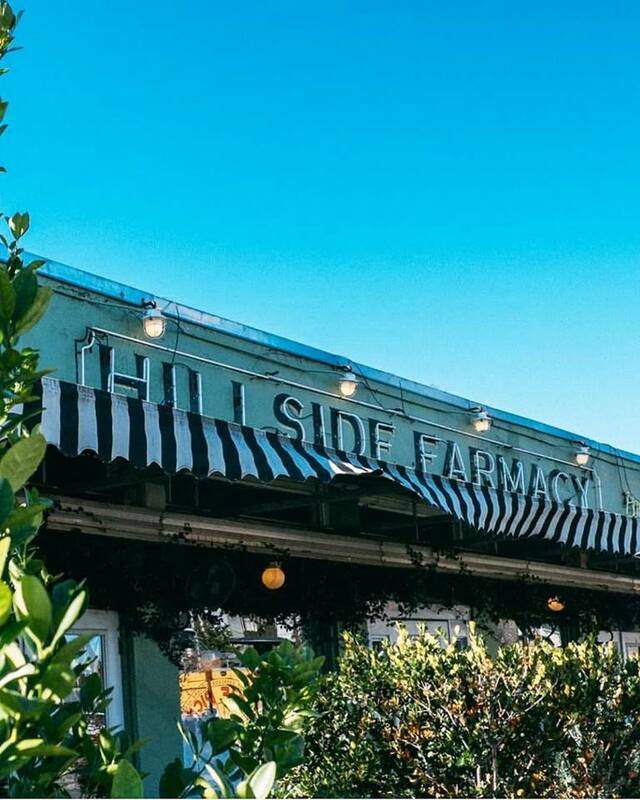 Hillside Farmacy’s location is central and convenient to all Austin area residents, just a few blocks east of Interstate 35, opposite downtown. Many guests arrive by car, but the foot traffic generated by the neighborhood’s shops, bars and other restaurants draw in a number as well. Seating capacity is about 100, distributed between a main dining area, separate side nook, and patios on the front and side. The side nook is used for regular dining but also may be reserved for special parties. When asked to name the restaurant’s signature dish, without hesitation Thorne replies, “Our Deer Creek and Taleggio mac-and-cheese, definitely. People love the mix of the varying textures. After prep we bake it off with a crumb topping, which gives it a golden crusty exterior and crispy edge, with a creamy, cheesy inside.” Patrons can order it with pancetta, poached egg or broccoli added. Hillside Farmacy is popular for breakfast and brunch as well as dinner. “Our breakfasts start with good bacon, good eggs, and fresh greens,” says Thorne. Their interpretation of the fried egg sandwich is a definite upgrade, an over-easy farm egg on brioche from Easy Tiger, topped with avocado, house-made aioli, sunflower sprouts, and fried green tomatoes. Promotions include half-price East Coast oysters on Monday evenings after 5, and an adult special modeled on the template of a fast-food kids’ meal. For $15 diners enjoy a big local burger, an order of fresh-cut fries and and an old fashioned. Hillside’s atmosphere is casual and friendly, and many patrons are such regulars that their predictable order can be put on just as they are seen entering the door. Providing this kind of engaged service seven days a week takes commitment from everyone on the staff. But it is not a heavy hand that keeps them on their toes and at the top of their game.